The bright stadium lights might feel a bit like a dark cloud for one player this Super Bowl Sunday because, not long ago, he lost much more than a game. 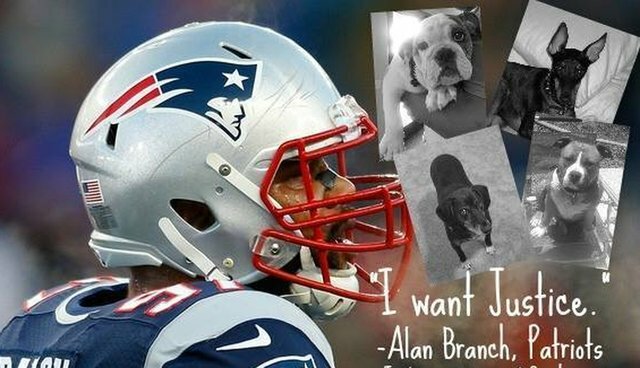 This past June, Alan Branch of the New England Patriots was one of several pet owners whose dogs died while staying at a Gilbert, Ariz., boarding facility. Four of the defensive tackle's dogs were among 23 who suffocated to death after being crammed into a small room together and left unattended. "It was definitely rough," he said. "I'm bouncing back slowly but surely from the loss. I just tried to be a rock for my family. Fortunately we're getting through it. The kids aren't crying or waking up crying missing their dogs right now. I think we're doing better." The boarding facility's owners and two others were originally charged with multiple counts of cruelty for the dogs' deaths in what came to be known as the "Gilbert 23" incident, but all were dropped over a lack of evidence. Prosecutors said it was unclear if neglect was to blame, or if the animals died because the ventilation system failed. For the bereaved pet owners, including Branch, not enough has been done to make up for the dogs' deaths. They're lobbying for authorities to reopen the case - and to crack down on similar businesses where pets may be put in danger. "I just want justice," Branch says. "And if anything, for Arizona to have stricter laws on what can be considered a boarding facility." According to Melissa Gable, a spokesperson for Animal Care and Control in Maricopa County, where the incident took place, no certification is currently required for operators of pet boarding facilities. For tips on picking a boarding facility for your pet, visit the Humane Society.